Apple has been making steady headway in the tablet market thanks to the power of the iPad Pro line and working with enterprises on mass deployments. I've always been somewhat squeamish about the thought of taking my 10.5-inch iPad Pro into the field or onto construction sites, but the new MobileDemand Rugged Case for 10.5-inch iPad Pro (Introductory pricing at $69.95) has changed my mind. 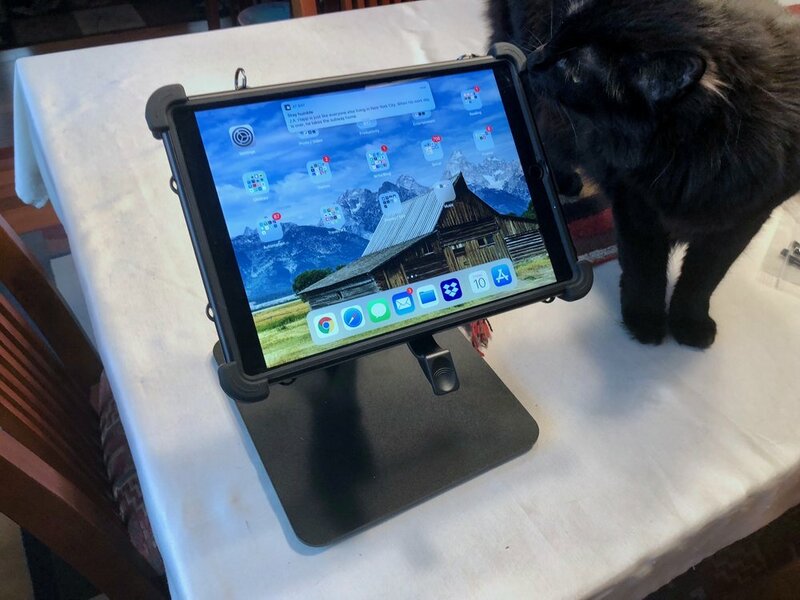 For the price (even at the full price of $99.95), the Rugged Case is inexpensive insurance for anyone who needs to use an iPad Pro outside of the confines of an office. The case uses a two-layer design consisting of an almost-indestructible outer plastic shell and an inner rubber boot. The screen is protected by an optional ($49.95) glass screen protector that should be installed prior to placing the iPad Pro into the case. That $49.95 charge can be avoided by simply registering for a product newsletter! The outer plastic shell is riddled with a number of mounting points for the many mounting options that are available, and also features four large corner bumpers, a dust cover for the Lightning port, and a surprisingly comfortable padded hand strap for one-handed carrying and use. MobileDemand also includes a handle that is attached to two steel rings on one side of the case. Those mounting points serve many purposes. In a retail situation, a point-of-sale mag strip reader or PIN pad can be attached to the case. Brackets that work with Ingenico, MagTek, PayPal and other payment module systems are available, and 3D cameras like the Intel RealSense Depth Camera D415 and other thermal cameras can also be mounted. At this point, the Rugged Case sounds like any other hardshell case for iPad Pro. The testing of the design proves that it's very much more than just another case -- a single case was used for 26 consecutive drops from 8 feet onto plywood on concrete, more abuse than an iPad Pro is normally going to take in a carrying accident. In fact, that same iPad Pro lasted through 135 drop tests from 4 to 8 feet. Pretty amazing, huh? That's a very public torture test of the Rugged Case and the iPad Pro, judging from the crowd watching by the end of the video. And yes, it was still working after all of the drop tests, not just the 26 consecutive drops from 8 feet. 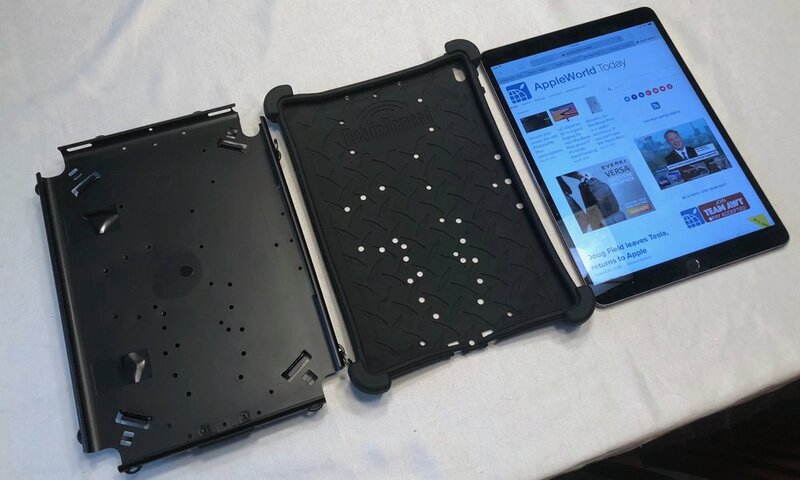 MobileDemand points out that the "Rugged Case fits tightly on the iPad and is not meant to be regularly removed", so it's best to install it once and leave it. The company does supply some plastic prying tools for removing the case if you need to for maintenance or to install another case. To install the case, you begin by removing the rubber boot from the plastic shell. Next, the boot is placed onto a desk or table and the iPad Pro is slipped into the boot until it is snugly attached. Now the iPad Pro and rubber boot are placed into the plastic shell starting with the corner with the power and volume buttons, and then the top of the iPad, and finally the long sides and the bottom of the iPad Pro are pushed in. Is the Rugged Case difficult or time-consuming to install? No. I timed myself putting it on, and it took only about two minutes to squeeze the rubber boot and iPad into the shell. MobileDemand also sent along several mounting tools. One is a snap mount that features a "ball" that's connected to the back of the case through a built-in quick mount. That ball fits into a spring-loaded Ram Mounts clamp that can then be attached to a wall mount, a heavy steel base, or even a forklift mount. The options ensure that your iPad Pro stays in one place in a vehicle, but can be removed in a moment when you need to have the device with you. About the hand grip that comes standard with the Rugged Case: I've suffered through a ton of these grips over the years, and MobileDemand somehow managed to create the first hand grip that is actually comfortable! It covers a good part of the back of the hand, and is padded so well that it doesn't cut off circulation when you're "one-handing" the iPad. It's easy to remove and re-install should you wish to install one of the mounting options. I've reviewed a number of "rugged" cases for iPads over the years, but the MobileDemand Rugged Case for the 10.5-inch iPad Pro is the first I would trust to stand up to field use, It's well designed, has an almost infinite number of mounting options, makes it easy to carry the iPad Pro with one hand, and the testing proves that it's worthy of the MIL-STD 810G, 516.6 IV shock/drop rating. Add to that the fact that it's one of the more reasonably-priced rugged iPad cases available, and I recommend it wholeheartedly. MobileDemand currently makes the case only for the 10.5-inch iPad Pro, but has plans for making a version for the 9.7-inch iPad in the future.